The thermal decomposition of 1-chloropropane in argon was studied behind reflected shock waves in a single pulse shock tube over the temperature range of 1015–1220 K. The reaction mainly goes through unimolecular elimination of HCl. The major products observed in the decomposition are propylene and ethylene, while the minor products identified are methane and propane. The rate constant for HCl elimination in the studied temperature range is estimated to be k(1015–1220 K) = 1.63 × 1013exp(-(60.1 ± 1.0) kcal mol−1/RT) s−1. The DFT calculations were carried out to identify the transition state(s) for the major reaction channel; and rate coefficient for this reaction is obtained to be k(800–1500 K) = 5.01 × 1014exp(-(58.8) kcal mol−1/RT) s−1. The results are compared with the experimental findings. The thermal decomposition of 1-chloropropane was studied behind reflected shock waves over a temperature range of 1015–1220 K. The radical chemistry is important in addition to the low-barrier unimolecular HCl elimination. The major products are propylene and ethylene and the minor products are methane and propane. Experimentally estimated and computationally calculated Arrhenius expressions for HCl elimination are reported in this paper. 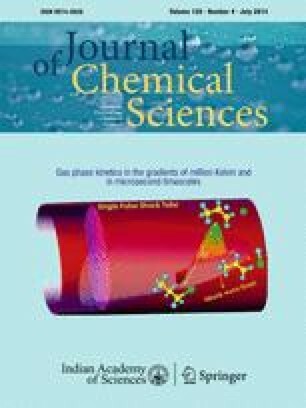 The online version of this article (doi: 10.1007/s12039-014-0666-0) contains supplementary material, which is available to authorized users. We acknowledge the financial support from Council of Scientific & Industrial Research (CSIR), India, for establishing the Single Pulse Shock Tube. We thank Mr. V Ravichandran of High Performance Computing Environment Facility for his valuable support, Mr. A Parandhaman for his help in the experiments and Mr. M Balaganesh for fruitful discussion. Mr. G Balaganesan of central workshop is acknowledged for the workshop support in the establishment of the shock tube facility. The electronic supplementary information (tables S1, S2, S3, S4 and S5) can be seen at www.ias.ac.in/chemsci.